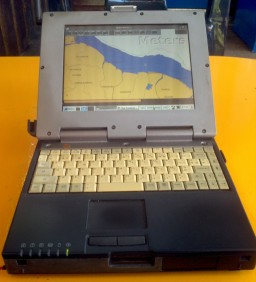 XINUTOP - Dedicated marine OS. MUPLEX - Soft serial, USB, bluetooth multiplexer. RASTOW - Raster charts organizer. OPENCPN - For TinyCore Linux. Fldigi: reception and display radio weather-fax and NAVTEX, via the sound card. 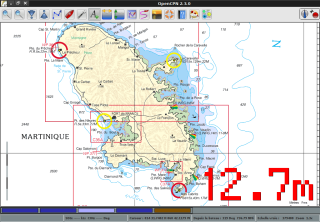 OpenCPN: chartplotter, tides, AIS, grib files, GPS interface and others NMEA navigation data (dashboard). 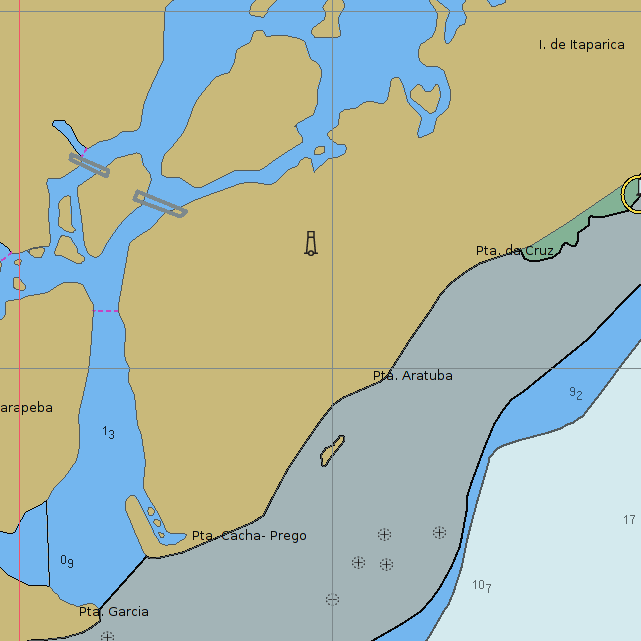 Handle raster (*.kap) and vector charts (CM93, S57/S63). PolarCOM: virtual instrumentation, from NMEA data. PolarView: chartplotter, tides, AIS, grib files, GPS interface and others NMEA navigation data (dashboard). Handle raster (*.kap) and vector (S57/S63) charts. 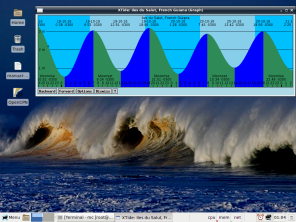 XTide: tides with numerical and graphical display, worlwide coverage. Zygrib: download and display weather grib files. OSD Depth: display water depth with big digits above any application (aka "on top"). 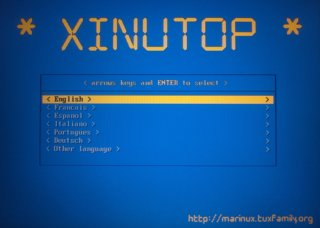 Xinutop is made in the KISS mind with a special care of simplicity, efficiency, reliability, lightness (who say bloatware ?) and can operate from multiple data devices (HDD, SSD, USB, SDcard, Flash) on a great variety of x86 compliant computers, from up-to-date hardware to low power or old processors. They poorly supporting the growing greed of currents OS, less and less compatible with embedded hardware, according to Wirth's law. Today it's much easier to add programs (only the programs that you need) on a simple system base than eradicate from the system heart softwares that you are useless. A robust architecture: main filesystem in squashfs, boot system protected, no write access. A persistent mode that allows to keep the user data and system changes in a transparent user layer above the main filesystem (as "data" partition in Linux-Android). A restore mode (factory reset) allowing to findnize exactly the original system (simply by deleting the user layer). Interesting if you want try audacious or hazardous sofware solutions ! A "home-save" function, to automatically save and move user home data during a restoration. A ramdisk mode, which boost time access, running Xinutop from a virtual harddisk emulated in memory (RAM mini 1Go). You can start it from a slow device as an USB key and run it faster than a conventional installation on a HDD. All your changes and data are keeped at reboot. A simplified boot and installation (no questions !) , simply copying by block mode to your device. The full compatibility with applications of the Debian distribution. You can install and run any other application from your user layer. Alvailable in *.img format to grab directly on a device and *.vdi to run simply into VirtualBox. 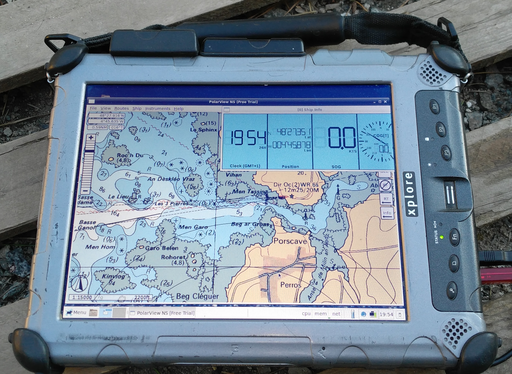 Xinutop on a up-to-date rugged tablet Xplore. Feedbacks, corrections, suggestions, derivatives are welcome. Thanks to Linux community and TuxFamily for hosting this project. COPYRIGHT 2010-2017 Free Software Foundation, Inc. License GNU. This is free software: you are free to use, change and redistribute it. Navigation beta software, tested with Debian 8.x, use it under your own responsability. NEW: Since august 2018 a *.vdi image is provided to run Xinutop into VirtualBox. 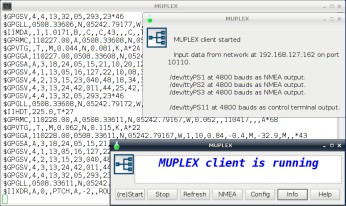 MUPLEX is a Linux soft multiplexer that can mix different input flows of real or emulate serial data NMEA and share it between multiple applications. Resolve the problem of exclusive access serial port, emulate USB or bluetooth by creating pseudos-terminal ports: /dev/ttyPS(x). Can replace a specialised NMEA multiplexer by a standard serial multiport PCI, PCI-E or USB. Can convert NMEA V1 V2 (4800bps) in NMEA V3 (38400bps) also called NMEA HS. 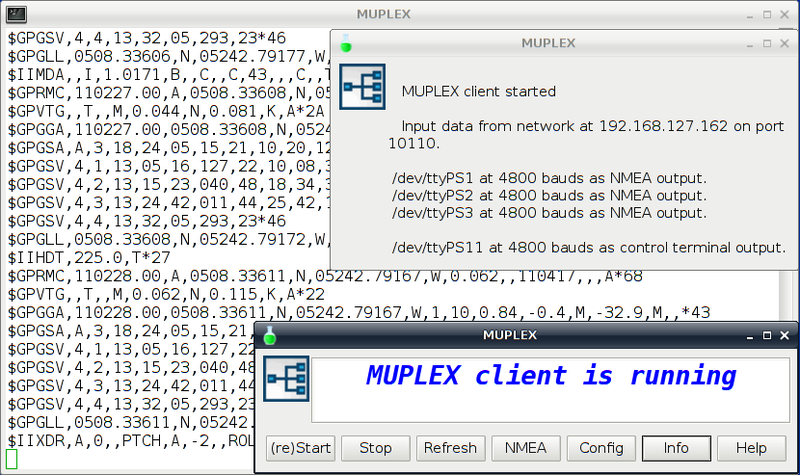 Adjust devices, pseudos-devices, flows data protocol by a simple conf file (muplex.conf). Lite shell bash (~20KB) in the linux mind, reusing existing and well-proven bricks, take a minimum of process and memory. Usable with any Linux distribution on x86 or ARM as it. Script may be considered as a template, modifiable as it without recompiliation for any customisation or others types of data, etc..
* Many input devices: serial: /dev/ttyS(x), USB: /dev/ttyUSB(x), bluetooth: /dev/rfcomm(x). * Optional, send and share data over the network or loopback by TCP server, some navigation applications can work directly in TCP. 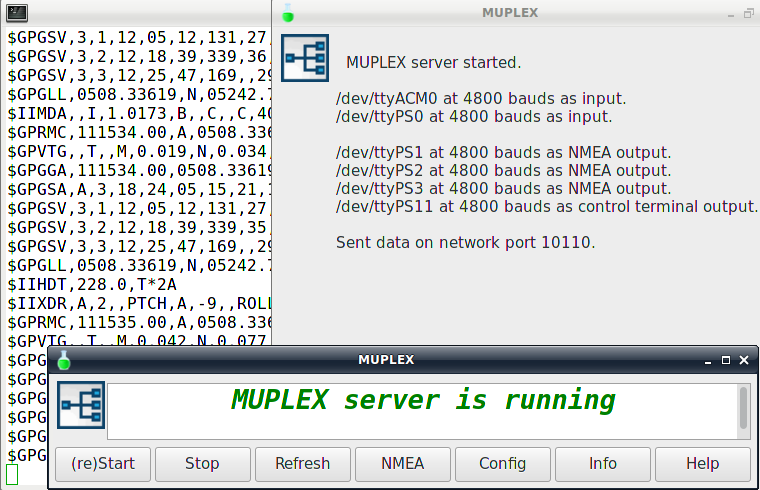 * Collect NMEA data from the network (can be sent by Muplex in server mode on another machine). The engine of Muplex is SoCat by Gerhard Reiger. Navigation beta software, tested with Debian 8.x Jessie, use it under your own responsability. OSD-DEPTH is a Linux echo-sounder repeater which uses the OSD (On Screen Display) technique to display the water depth from NMEA sentences as DBT (Depth Below Transducer) or DPT (Depth). See screen copy at top of document. Display digits (resizeable) above any application. Using with a GPS and chart plotter as OpenCPN, you get in one screen essential parameters of navigation. Many input devices; serial: /dev/ttyS(x), pseudo-serial: /dev/ttyPS(x-muplex named), USB: /dev/ttyUSB(x), bluetooth: /dev/rfcomm(x), network: <IP adress:port> on TCP address or loopback. Display in meters, feets, fathoms. Usable with any Linux distribution. Lite shell bash (8KB) in the Linux mind, reusing existing and well-proven bricks, take a minimum of process and memory. 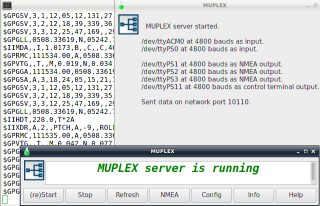 Script may be considered as a template, modifiable without recompilation for any customisation or display others data (multiline also avaible with OSD), configuration by GUI, etc... and demonstrate how to access, format and display NMEA data with standard *nix tools. Display version, help and exit. Osd Depth launches as a flip flop: if you relaunch Osd Depth when it's running, it stops. At the next relaunch it restart and so on. Require Mawk (neither Awk nor Gawk !) by Mike Brennan. Require OsdCat (xosd-bin package) by Martijn van de Streek. Require SoCat by Gerhard Reiger. Recommand Zenity by Glynn Foster or better yad by Victor Ananjevsky (many less dependencies). Recommand Xfontsel (included in x11-utils package) by Ralph R. Swick.or TKfont by Neil Grant. Recommand Putty by Simon Tatham. Suggest OpenCPN by David S. Register. Suggest Muplex by Frank Baudet. Hoping some help to display 7 segments nice fonts for X11. Shell script, compatible with any Linux distribution. Decompress the archive in /usr/local/bin/. At first launch Osd Depth create a .osd-depth.conf (hidden file) in your home directory and exit. You must configure manually this file to adapt at your case and relaunch Osd Depth. RASTOW (raster-stow contraction) classify your raster charts collection (*.kap files) creating 96 subdirectories divided by timezone (15° steps, without any country exception), north and south, above and below 45° of latitude. Two modes of creation are available: <copy> or symbolic <link>. At the end of the operation, a chartlist.txt containing a catalog of your charts is automatically created. Using <chartlist> command, you can create only a chartlist from your database. In copy mode, the created database may be bigger than the original base because a map can have a part in more than one timezone or <45° to >45° in latitude, and it resides in all the timezone subs covered and it is copied twice in differents directories. So, use symlinks if your space storage is critical. <update> change the file date to the last update edition. <rename> change the filename by the chart title. It's a good practice to make an update before a copy or rename command: if two files are equals, only the most recent will be handle. 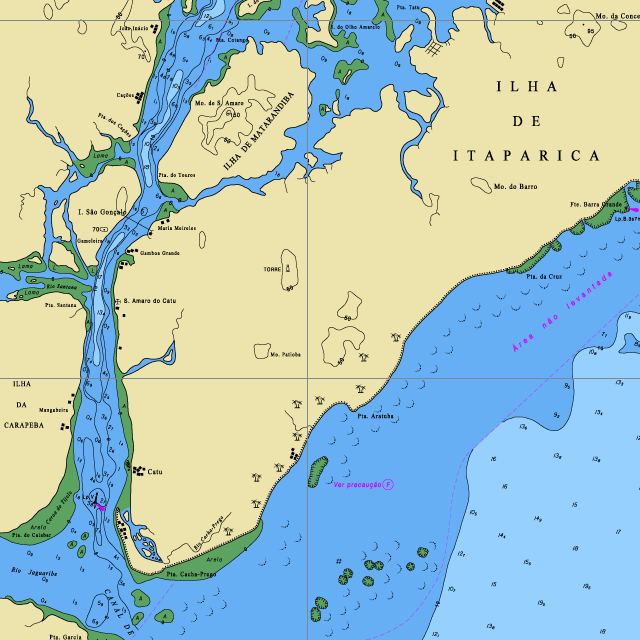 About raster charts: these charts are not so powerfull and practical than vector charts (no more details zooming, more bigger size), but generally come from original charts edited by officials hydrographics services, the source of vectors charts, so, sometime they may have more details than commercial vector charts (see example) or it is usefull to consult its in case of doubt. Some others people have the nostalgia of paper chart look and feel, and these charts keep the same aspect. 45+: between 45° and 90° of latitude ; 45-: between 0° and 45°. TZ+: Time Zone east ; TZ-: Time Zone west ; TZ=: particular case of TZ00 and TZ12, witch have 7°30' at east and west. 02: Time Zone; in this case TZ00+TZ01 to TZ00+TZ01+TZ02 => 7°30'+15°=22°30' to 37°30' (22°30'+15°) of longitude. copy copy all files from SOURCEDIR to DESTDIR. link create symlinks from files in SOURCEDIR to DESTDIR. update set the timestamp of files from SOURCEDIR at edition creation. rename rename all files from SOURCEDIR with the header's title. rewrite the index table from SOURCEDIR, editing it in place. chartlist create only a chartlist from SOURCEDIR into this directory. SOURCEDIR: the directory path which contains your charts. This directory may contain subdirectories. DESTDIR: the directory path for destination. If it not exist, it will be created. Recommand libbsb by Pavel Kalian. Recommand detox by Patrick Shoenfeld. Suggest OpenCPN by David S. Register and PolarView. Suggest MXmariner by Will Kamp and Marine Navigator by Ronald Koenig on Android. Type '/usr/local/bin/rastow.sh' and choice your operation. For people who like extrem-ultra-light solutions, TinyCore Linux from Robert Shingledecker is a very interesting OS. This package can run OpenCPN V4.0 on this platform. This is the last version for TinyCore from here. Up to 4.0, source file contain many hooks to OpenGL, not alvailable for TinyCore, and the compilation become complicate. Here are some devices used with Muplex and OSD_Depth. All are NMEA compatible and are only sensors, not too much expensive and alvailable without display (not so many in the market), nice for virtual instrumentation . Listing only for information. Any affiliation with firms. GPS Haicom HI-204 serial & USB. Meteo sensor LCJ capteurs CV3F (also resale by Furuno as Rowind): wind speed and direction, air temp, optional barometric pressure. Multiplexer Shipmodul Miniplex (USB and serial, bluetooth, wifi). Debian: the base of Xinutop. TinyCore Linux: not only tiny, but modulable and a very interesting mode of zero installation. Puppy Linux: also tiny for low power systems. As say Barry Kauler, the leader project, don't buy a new computer, download it ! Android-x86: a very nice implementation of Linux-Android OS on x86 compliant processors. Shell Bash: powerfull and native with all Linux distro, base script for Muplex, Rastow and OSD-Depth. X11-Basic: Basic is not dead and can make interesting things by simple ways. GTKdialog and Yad: small and lightweight GUI dialog creation. Geany: lightweight IDE with syntax highlighting, suited for these scripts languages. Ultralight and low-power computers in 12V with adapted OS . Nav data display as text with LCDproc. SensorTag, cheap multi sensor kit from Texas Instruments. SenseHat for Raspberry ; gyroscope, accelerometer, magnetometer, temperature, barometric pressure, humidity... for ~35$. The project about these sensors is to convert and send these data in NMEA format. Tiller pilot using industrial linear actuator, remoted by (rugged) mobile phone and controled by computer (naturally !). ROOTED IMAGE FOR MTT TABLET 7"